After years of wondering how OSHA could possibly manage and use data collected under the 2016 E-Recordkeeping Rule, the agency has finally revealed its hand. Last month, OSHA launched its Site-Specific Targeting 2016 (“SST-16”) inspection plan, which outlines the agency’s strategy to target establishments for inspection based on the 300A data collected by OSHA under its Final Rule to Improve Tracking of Workplace Injuries and Illness (i.e. the “E-Recordkeeping Rule”). What is OSHA’s SST-16 Inspection Plan? The SST-16 Inspection Plan is OSHA’s site-specific targeting inspection plan for non-construction workplaces that have 20 or more employees. 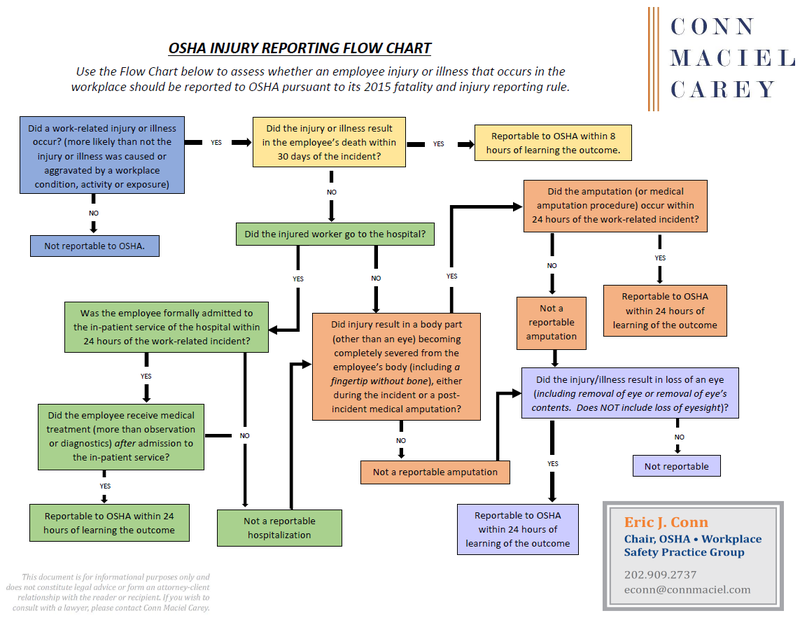 The Plan is based on the calendar year 2016 300A injury and illness summary data that employers submitted to OSHA via OSHA’s Injury Tracking Application (aka, the E-Recordkeeping Portal) in December 2017. Employers should not be surprised by OSHA’s site-specific targeting plan, as this is not a novel program for OSHA. SST was the grandfather of all OSHA enforcement emphasis programs. Prior to 2014, SST programs used injury and illness information collected under the former OSHA Data Initiative to target the agency’s inspection resources. The SST-16 Plan selects individual establishments for inspection based on their CY 2016 300A injury data submitted under the E-Recordkeeping Rule. OSHA has created a software that will generate a list of targeted establishments for enforcement from this pool of data. The targeted establishments will be those with Days Away, Restricted or Transferred (DART) injury rates above some as yet undefined threshold, together with a random sample of establishments that OSHA believes were required to submit 2016 300A injury data under the E-Recordkeeping Rule, but which did not submit the data in 2017. Different DART rates for manufacturing and non-manufacturing establishments are set as selection criteria “to achieve a 50/50 representation on the list,” although the triggering DART rates remain unclear at this point. OSHA representatives have indicated that the agency is waiting to see how large the final list is before setting the DART rates for manufacturing and non-manufacturing establishments. Although establishments with elevated DART rates and those who did not submit the required data are OSHA’s primary enforcement focus, establishments with lower DART rates are not completely in the clear. To verify data accuracy, OSHA also will include a random sample of low injury rate establishments on the inspection list for quality control purposes. Recall that OSHA has expressed concern about underreporting and underrecording as a result of the E-Recordkeeping Rule, and this tool will help check for that concern. In other words, any establishment that submitted CY 2016 300A data is subject to being placed on the list – at least initially. With respect to the scope of SST-16 inspections, OSHA explained that the inspections will be comprehensive. An OSHA Area Director can open an inspection conducted under the SST-16 program as either a comprehensive safety or a limited scope health inspection, based on the Area Office’s knowledge of the nature of the workplace and the hazards likely to be found there. Furthermore, if the site has been inspected previously, the Area Director can expand the inspection to cover both health and safety hazards based on prior issues identified from that inspection history. If an establishment is selected for inspection under the SST-16 Plan and also a programmed inspection under one or more of OSHA’s other initiatives, the SST-16 inspection can run concurrently with that NEP/LEP inspection, and inspectors will be expected to classify them separately. If an employer is subject to an unprogrammed inspection – i.e., an inspection arising out of a complaint, fatality, serious injury, or referral – the inspector has the discretion to conduct the unprogrammed inspection and SST-16 inspection concurrently or separately. is a public sector employer (federal, state, or local government). Finally, because OSHA is concerned about an overall lack of compliance with the E-Recordkeeping Rule based on the purportedly lower than expected number of employers submitting data through the electronic portal, in addition to targeting establishments experiencing elevated DART rates, the agency also is targeting establishments that did not submit CY 2016 300A data at all. OSHA originally anticipated that roughly 450,000 establishments would be required to submit data by the initial December 2017 data submission deadline. However, only approximately 214,000 submissions were received by OSHA. To further incentivize employers to submit their 300A data, OSHA issued an interim enforcement memorandum explaining that establishments will be cited for an “other-than-serious” violation with a potential penalty (depending on the circumstances) for failing to submit 300A data. Employers should make sure that their establishments covered by the E-Recordkeeping Rule are prepared in the event of an inspection. Although it is difficult to assess which establishments will be included on OSHA’s inspection target list, it would be prudent to check your establishment’s CY 300A data to assess whether there is a likelihood it could make the list because of an elevated DART rate (compared to industry average rates). Those establishments should begin taking steps to prepare for an inspection, and audit 300 Log data from 2016, 2017, and 2018. Furthermore, covered establishments that did not submit the requisite recordkeeping data through OSHA’s electronic portal (or otherwise) should be prepared to provide it to OSHA if/when the agency arrives at your facility. Under the interim enforcement memo, employers that failed to submit 2016 300A data, but who provide a paper copy to the inspector during the inspection, will still be cited for an other-than-serious recordkeeping violation, but will be assessed no penalty. Finally, employers should begin thinking about the next deadline – March 2, 2019 — to submit their 2018 300A injury data. Although this deadline is still three months away, it is important to begin making plans to comply with the E-Recordkeeping Rule’s data submission requirements, including completing the 300As and auditing the data for accuracy. Despite the expectation that the Trump Administration would lessen the burden on employers in this area, OSHA’s course of action over the past few months demonstrates that most of the data submission requirements — as well as the anti-retaliation elements of the rule — are likely here to stay, at least for the near-term. The only revision expected is a finalization of OSHA’s proposal to remove the requirement for establishments with 250 or more employees to submit 300 and 301 data (now in the final rule stage). And now that OSHA has developed an inspection targeting plan based on the data submitted under this rule, employers are going to be subject to further scrutiny for high injury and illness rates, which in the long run could lead to additional OSHA citations. Lowering your recordable injuries and illnesses – while not running afoul of OSHA’s anti-retaliation restrictions — is now more important than ever.